To schedule your appointment, Call Today! You may have suffered for months or years with nasal and sinus problems, thinking that since the allergy pills and nasal sprays weren’t fixing the problems you just had to suffer. Well, relief is within reach, and it is our primary focus at the Nasal & Sinus Center of Austin. Austin may be the allergy capital, but we have thousands of patients – local, national, and international – who have made suffering a thing of the past. 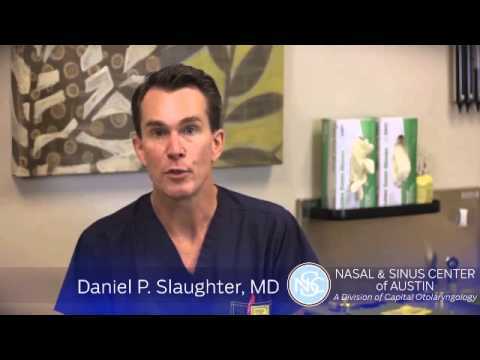 Whether it is for medical treatment of chronic allergies, state-of-the-art minimally invasive balloon sinuplasty, or external correction of cosmetic deformity, the Nasal & Sinus Center of Austin provides comprehensive care for all of these conditions and so much more. Our practice offers many of the latest minimally invasive, office-based procedures such as balloon sinuplasty, endoscopic turbinate reduction, septoplasty, and many others. Our ear, nose, and throat specialists have extensive experience in the medical evaluation and treatment of all forms of nasal and sinus disorders, including cutting-edge, minimally invasive surgical procedures when surgery is necessary. Dr. Christopher P. Thompson, Dr. Zachary D. Wassmuth, Dr. Esther Cheung-Phillips, Dr. Yi-Hsuan Emmy Wu, and Dr. Latif Dharamsi enjoy an exceptional reputation for providing comprehensive and innovative solutions, and they receive referrals from all over the United States. Our board-certified otolaryngologists have the qualifications and ability to direct and manage all forms of treatment, correct problems based on the individual needs of the patient, and ensure long-term success and safety. To request an appointment at the Nasal & Sinus Center in Austin, Texas, call (512) 394-4858 in Austin or (512) 271-4871 in Lakeway, or you can request one online. If you have an urgent medical need and need to talk to our doctors after our regular hours, please call our office at (512) 394-4858. A doctor is on-call 24 hours a day. Your call will be returned promptly.